Atelectasis is a collapse of lung tissue affecting part or all of one lung. This condition prevents normal oxygen absoption to healthy tissues. Atelectasis can result from an obstruction (blockage) of the airways that affects tiny air scas called alveoli. Alveoli are very thin-walled and contain a rich blood supply. They are important for lung function, since their purpose is the exchange of oxygen and carbon dioxide. When the airways are blocked by a mucous "plug," foreign object, or tumor, the alveoli are unable to fill with air and collapse of lung tissue can occur in the affected area. Atelectasis is a potential complication following surgery, especially in individuals who have undergone chest or abdominal operations resulting in associated abdominal or chest pain during breathing. Congenital atelectasis can result from a failure of the lungs to expand at birth. This congenital condition may be localized or may affect all of both lungs. Causes of atelectasis include insufficient attemps at respiration by the newborn, bronchial obstruction, or absence of surfactant (a substance secreted by alveoli that maintains the stability of lung tissue by reducing the surface tension of fluids that coat the lung). This lack of surfactant reduces the surface area available for effective gas exchange causing it to collapse if severe. Pressure on the lung from fluid or air can cause atelectasis as well as obstruction of lung air passages by thick mucus resulting from various infections and lung diseases. Tumors and inhaled objects can also cause obstruction of the airway, leading to atelectasis. Anyone undergoing chest or abdominal surgery using general anesthesia is at risk to develop atelectasis, since breathing is often shallow after surgery to avoid pain from the surgical incision. Any significant decrease in airflow to the alveoli contributes to pooling of secretions, which in turn can cause infection. Chest injuries causing shallow breathing, including fractured ribs, can cause atelectasis. Common symptoms of atelectasis include shortness of breath and decreased chest wall expansion. If atelectasis only afects a small area of the lung, symptoms are ususally minimal. If the condition affects a large area of the lung and develops quickly, the individual may turn blue (cyanotic) or pale, have extreme shortness of breath, and feel a stabbing pain on the affected side. Fever and increased heart rate may be present if infection accompanies atelectasis. To diagnose atelectasis, a doctor starts by recording the patient's symptoms and performing a thorough physical examination. When the doctor listens to the lungs through a stethoscope (ausculation), diminished or bronchial breath sounds may be heard. By tapping on the chest (percussion) while listening through the stethoscope, the doctor can often tell if the lung is collapsed. A chest x ray that shows an airless area in the lung confirms the diagnosis of atelectasis. If an obstruction of the airways is suspected, a computed tomography scan (CT) or bronchoscopy may be performed to locate the cause of the blockage. If atelectasis is due to obstruction of the airway, the first step in treatment is to remove the cause of the blockage. This may be done by coughing, suctioning, or bronchoscopy. If a tumor is the cause of atelectasis, surgery may be necessary to remove it. Antibiotics are commonly used to fight the infection that often accompanies atelectasis. In cases where recurrent or long-lasting infection is disabling or where significant bleeding occurs, the affected section of the lung may be surgically removed. Bronchial — Relating to the air passages to and from the lungs including the bronchi and the bronchioles. Bronchoscopy — A procedure in which a hollow, flexible tube is inserted into the airway to allow visual examination of the larynx, trachea, bronchi, and bronchioles. It is also used to collect specimens for biopsy or culturing and to remove airway obstructions. Incentive spirometer — A breathing device that provides feedback on performance to encourage deep breathing. Mucus — A thin, slippery film secreted by the mucous membranes and glands. Postural drainage — Techniques to help expel excess mucus by specific poistions of the body (that decrease the effects of gravity) combined with manual percussion and vibration over various parts of the lung. Surfactant — A substance secreted by the alveoli in the lungs that reduces the surface tension of lung fluids, allowing gas exchange and helping maintain the elasticity of lung tissue. Tumor — An abnormal growth of tissue resulting from uncontrolled, progressive multiplication of cells. If atelectasis is caused by a thick mucus "plug" or inhaled foreign object, the patient usually recovers completely when the blockage is removed. If it is caused by a tumor, the outcome depends on the nature of the tumor involved. If atelectasis is a result of surgery, other postoperative conditions and/or complications affect the prognosis. When recovering from surgery, frequent repositioning in bed along with coughing and deep breathing are important. Coughing and breathing deeply every one to two hours after any surgical operation with general anesthesia is recommended. Breathing exercises and the use of breathing devices, such as an incentive spirometer, may also help prevent atelectasis. Although smokers have a higher risk of developing atelectasis following surgery, stopping smoking six to eight weeks before surgery can help reduce the risk. Increasing fluid intake during respiratory illness or after surgery (by mouth or intravenously) helps lung secretions to remain loose. Increasing humidity may also be beneficial. Postural drainage techniques can be learned from a respiratory therapist or physical therapist and are a useful tool for anyone affected with a respiratiory illness that could cause atelectasis. Because foreign objects blocking the airway can cause atelectasis, it is very important to keep small objects that might be inhaled away from young children. Decrease or loss of air in all or part of the lung, with resulting loss of lung volume itself. absorption atelectasis , acquired atelectasis obstructive atelectasis; that caused by an obstruction of the airway that prevents intake of air, e.g., secretions, foreign body, tumor, or external pressure. congenital atelectasis that present at birth (primary a.) or immediately thereafter (secondary a.) . lobar atelectasis that affecting only one lobe of the lung. segmental atelectasis that affecting one segment of a lung. tympanic membrane atelectasis a complication of chronic serous otitis media, with viscous fluid in the middle ear and thinning of the tympanic membrane, which adheres to middle ear structures; there is usually conductive deafness. 1. The absence of gas from all or part of the lung, due to failure of expansion of the alveoli. 2. A congenital condition characterized by incomplete expansion of the lungs. an abnormal condition characterized by the collapse of alveoli, preventing the respiratory exchange of carbon dioxide and oxygen in a part of the lungs. Symptoms may include diminished breath sounds or aspiratory crackles, a mediastinal shift toward the side of the collapse, fever, and increasing dyspnea. As the remaining portions of the lungs eventually hyperinflate, oxygen saturation of the blood is often nearly normal. The condition may be caused by obstruction of the major airways and bronchioles, by compression of the lung as a result of fluid or air in the pleural space, or by pressure from a tumor outside the lung. Loss of functional lung tissue may secondarily cause increased heart rate, blood pressure, and respiratory rate. Secretions retained in the collapsed alveoli are rich in nutrients for bacterial growth, a condition often leading to stasis pneumonia in critically ill patients. See also postoperative atelectasis, primary atelectasis. The partial or total collapse of lung parenchyma, due to obstruction of a bronchus by a mucus plug, infection or cancer; it commonly occurs following general anaesthesia. Low-grade fever, dry cough, chest pain, shortness of breath. Mild atelectasis is treated with deep breathing exercises and respiratory therapy; atelectasis secondary to cancer may be managed by therapeutic bronchoscopy. Partial lung collapse Chest medicine The partial or total collapse of lung parenchyma, due to obstruction of a bronchus by a mucus plug, infection or CA; it is common post general anesthesia Clinical Low-grade fever, dry cough, chest pain, SOB Management Mild atelectasis is treated with deep breathing exercises and respiratory therapy; atelectasis 2º to CA may be managed by therapeutic bronchoscopy. See Plate atelectasis. Reduction or absence of air in part or all of a lung, with resulting loss of lung volume. 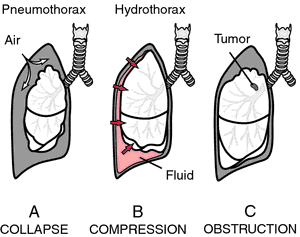 Failure of the normal expansion of part or all of a lung. This is a feature of the RESPIRATORY DISTRESS SYNDROME of premature babies. The term may be used more generally to refer to failure of dilatation of a part that normally dilates. n the complete or partial collapse of a lung. a collapsed or airless state of the lung, which may be acute or chronic, and may involve all or part of the lung. See also microatelectasis. The primary cause of atelectasis is obstruction of the bronchus serving the affected area. In fetal atelectasis the lungs fail to expand normally at birth. that present at (primary atelectasis) or immediately after (secondary atelectasis) birth. that affecting only a lobe of the lung. that affecting only a lobule of the lung. congenital atelectasis in which the alveoli have never been expanded with air. The images of foreign body aspiration on chest radiographs are typically nonspecific although it may reveal areas of increased opacities, postobstructive infiltrate or hyperinflation, and atelectasis. 6) Diffuse 0 Biopsies without or with 14 diffuse crush artifact/ atelectasis and/or hemorrhage,g No. Physiotherapy aims to address well-known pathophysiological effects of abdominal surgery on the respiratory system including atelectasis (Duggan and Kavanagh 2005, Hedenstierna and Edmark 2010, Tusman et al 2012), reduced muco-ciliary clearance (Bilgi et al 2011, Gamsu et al 1976, Konrad et al 1993), diaphragm dysfunction (Blaney and Sawyer 1997, Ford et al 1983, Kim et al 2010), reduced lung volumes (Cheifetz et al 2010, Fagevik Olsen et al 2009, Stock et al 1985) and reduced respiratory muscle and cough strength (Barbalho-Moulim et al 2011, Bellinetti and Thomson 2006, Kulkarni et al 2010). Caption: Figure 2: CT chest showing bibasal atelectasis, more prominent on the left. Effect of maxillofacial Fixation on the incidence of postoperative pulmonary Atelectasis. This precipitous decline in the status of the patient could be observed in something as simple as atelectasis after a diagnosis of ACS. Chronic atelectasis or pleural fibrosis can lead to spinal curvature. The scan revealed mild to moderate ascites with mild bilateral pleural effusion with passive atelectasis of underlying lung parenchyma (Figures 2-6). USPRwire, Tue Jan 13 2015] GlobalData's clinical trial report, "Atelectasis Global Clinical Trials Review, H2, 2014" provides data on the Atelectasis clinical trial scenario. Contract awarded for Provide suction equipment for ventilation respiratory infections and prevent atelectasis caused by the accumulation of secretions in patients marchigue hospital. Rounded Atelectasis that Disappeared after Bronchoscopy. Pulmonary atelectasis is described as a state of a given region of lung parenchyma collapsed and nonaerated, associated with loss of lung volume and capacity, diagnosed from clinical and complementary tests (SCHINDLER, 2005).